During the first weeks of their education, masses of freshman marketing students still get confronted with Jerome McCarthy’s 4P model. A tool created more than 50 years ago, in an age where customers were labeled “buyer” or “consumer”. And though the 4 P’s still may provide a fair means for defining a traditional marketing mix, I dispute that “putting the right product in the right place, at the right price, at the right time” is the most important course that 21st century students should get on the menu. In the era of content, communication, conversation and customer experience (coincidently all starting with a C,) a marketer’s capability to create a decent message house, translate it into a captivating story, and use it to engage with a specific audience is probably more essential than mastering the 4 P’s. This is why I am dedicating this post to mastering the 3 P’s of presenting: Pitch,Preparation and Presentation. The setting is simple: when you want to deliver specific content to a specificaudience via a specific medium, you will need to connect the corner points of the triangle in the picture above. First of all you will need to define your Pitch. The message(s) you want your audience to remember. How you will grab their attention and capture their interest. The story you want to tell them. This is where techniques like power mapping, message house building and storyboarding will come in. Take ample time for your Preparation. Choose the most effective medium (e.g.PowerPoint show, Prezi, naked speech, video testimonials, …) for getting your story across and adapt your content to it. This is where your right brain hemisphere comes to the fore. When creativity, design and empathy turn out to be your most valuable attributes. And finally, the moment will come when you are scheduled to face your audience and deliver your Presentation. Be prepared. Use all possible means of visual, verbal and non-verbal communication to persuade your listeners with your value proposition and to call them to action. In the next 3 chapters, I will further elaborate on the 3 P’s and give some tips, tricks and tools for better pitching, preparing and presenting your content. Finding the right pitch often boils down to pinpointing a sticky story to tell. With the right mix of ethos, pathos and logos you can appeal to the hearts and the minds of those listening to you. In my blog post of January 10, 2013 I have written about the 7 C’s of a good story: compelling, credible, concrete, clear, consistent, customized andconversational. If you remember these seven adjectives, you’re already one step closer to a great pitch. When defining your value proposition, never forget that value is in the perceptionof the beholder. Adapt your pitch to address the WIIFM (What’s In It For Me) concern(s) of your audience. And give them something in return for listening to you. As mentioned in the previous bullet, it’s extremely important that you have a good understanding of who will be in the room. Doing some upfront research and power mapping will help you to tailor your pitch and (later) customize your presentation to their specific knowledge, needs and expectations. Building a message house is a great and simple means for defining, simplifying and structuring your messages, and to make sure your audience will remember them. You could also consider creating a mind map and/or drawing a story board. These tools will help you to sort out your thoughts and put your ideas in a sequence that easily translates into a presentation. A good way to validate your pitch is putting it to the elevator test. Can you ‘sell’ your message(s) in 30 seconds? Can you summarize your story on the back of a napkin? Can it be understood by your mother in law? 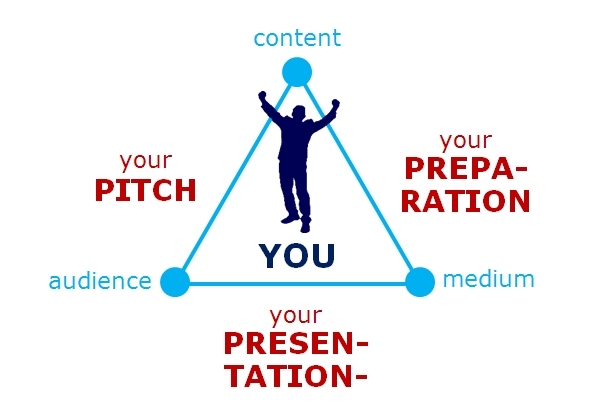 Once your pitch is completed, you’re all set to start preparing your presentation. Don’t forget that HOW you tell things may be as important as (or sometimes even more important than) WHAT you actually tell. Rome wasn’t built in one day. Neither will you be able to create a good presentation in a few hours. Crafting a presentation ― yes, even a business or technical one ― is a creative process. A process that takes more than a PC with PowerPoint (or Keynote, or Prezi, or …) installed on it. As I wrote in my previous post, it all starts with finding your pitch: thinking about the story you want to tell, the messages you want to convey, and the results you want to obtain. So, don’t start creating a single slide before you have figured out WHAT you want to tell to WHOM, and HOW you’re are actually going to deliver it. Only then comes the ‘packaging’ of your content. Always start with the end in mind. Take a blank sheet of paper and write down (no more than) three results you want to obtain from your presentation. What impressions do you want the people in the room to take home? What do you want them to remember about your product or service? What action do you want them to take after the meeting? Then inventorize your assets: what facts and figures, anecdotes, trivia, case studies, experience, demos or prototypes, etc. do you have on hand that may help you achieve these objectives? Based upon the outcome of the questions above, you may select the most suitable medium for delivering your content, e.g. a traditional slide presentation, a naked speech, maybe supported by video testimonials or — why not — a live demonstration. Note that your choice may also be influenced by the size and composition of your audience, the layout of the room, or the technical facilities you have on hand. Make sure your talk has a begin, a middle and an end. Structure it the AIDA way. As the first seconds of your performance are crucial for grabbing your audience’s attention, choose a catchy title and a powerful opening slide. Think visual. Use images to communicate, not decorate. Translate concepts to visual metaphors. Look for compelling ways to conceptualize facts, processes and data. You won’t need artistic drawing skills; a bit of analytical sense and a good portion of creativity will certainly do. Analyze. Surprise. Focus. Simplify. Cut the crap and don’t feed the chameleons. Keep your presentation short and sweet. And when you prepare slides, keep them clear, clean and consistent. Practice makes perfect. Rehearse your presentation as often as needed. In front of your mirror, your family or your colleagues. Or use a video recorder to tape your performance. But most of all, reserve ample time for your preparation. The time you invest in realizing, refining and rehearsing your presentation should be proportional to the importance of your talk, and reverse proportional to the time you will be given to present. I am aware that many of you may suffer from glossophobia, or fear of public speaking. But honestly, if you have invested enough time in defining your pitch andpreparing your presentation there’s really not that much left to worry about. Make sure to avoid unpleasant surprises. Arrive at the venue well in time, get familiar with the room in which you will present, and check the A/V equipment before your start. And when you’re planning a demo, dry-run it a few minutes ― not a few hours! ― in advance. Go on stage with a positive attitude. Don’t get paralyzed by stage fright. You know that you can do it! Take a deep breath before you start and give the audience what they came for. Start with a short silence. Then grab your audience’s attention from the first second onward. Surprise, intrigue or provoke them with an opening statement or poll. As I have explained in many of my older blog posts, when you give a presentation, you need to get your audience engaged. Appeal to their emotions, by telling a personal story. A good practice is to try to make eye contact with a few individuals in the audience and monitor their body language. But, watch your own body language and nonverbal communication too. Your tone of voice, volume of speech, as well as your facial expression, stance and gestures should add to or complement your verbal message. Speak in short sentences and pause often. Pause right before a key point to create a sense of anticipation. Pause right after a key point to allow it to sink in. And, most importantly, don’t forget to breathe. Take care of your speaking time. Ask a time keeper in the audience to give you a five or ten minute warning. If you feel you’re going to run over time, adapt your story and/or your pace, or consider skipping details and less meaningful slides. Concentrate on the message — not the medium. Only present your own pitch and show the slides you prepared yourself. Don’t let the visuals dominate your talk. Never read your slides aloud: most people in the room already know how to read! End your presentation in a powerful way. Your closing is your chance to leave a final impression on the audience. Don’t lose energy. Don’t change style. Don’t stop cold. Summarize your main ideas and key points. And call the people in the room to action. The 3 P’s. Do you still know what they stand for? If you want to be a professional public presenter, then take control of your pitch, yourpreparation and your presentation. This article was written by Marc Jadoul from Business2Community and was legally licensed through the NewsCred publisher network. If you have made a decision to have a mobile app developed for your small business, you probably don’t plan on engineering it yourself….